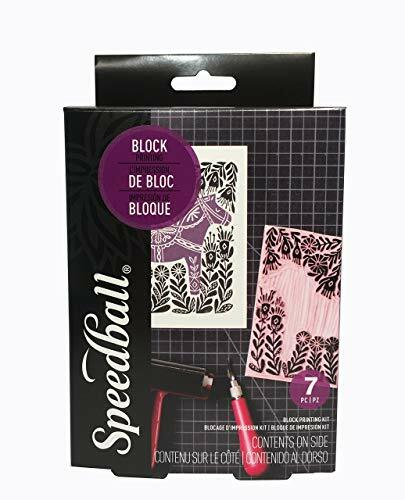 The Speedball Super Value Block Printing Starter Kit is perfect for the beginner printmaker and students. The kit has all the essentials to get you started in printmaking. Use the block printing starter kit to create your own prints, greeting cards and many other paper crafts. The Speedball Super Value Block Printing Starter Kit is perfect for the beginner printmaker and students. It can be used at home or in school. The kit has all the essentials to get you started in printmaking. Each kit includes: 1.25oz (37ml) Black Water-Soluble Block Printing Ink, #49 Soft Rubber Pop-In Brayer, Lino Handle, #1, #2, and #5 Lino Cutters and 4 x 6 inch Speedy-Carve block. The linoleum handle unscrews at the top so you can conveniently store the cutters in there and never have to worry about losing them! Use the block printing starter kit to create your own prints, greeting cards and many other paper crafts. This super value bundle will save you money by not having to purchase each of these products separately! We also recommend you purchase a bench hook to help you safely carve. - SAVES YOU MONEY - This super value bundle will save you money by not having to purchase each of these products separately! - WHAT'S INCLUDED - Kit contains: 1.25oz (37ml) Black Water-Soluble Block Printing Ink, Soft Rubber Pop-In Brayer, Lino Handle, #1, #2, and #5 Lino Cutters and 4 x 6 inch Speedy-Carve block. - PERFECT INTRO SET - The block printing starter kit has all the essentials to get you started in block printing. It is ideal for students and beginners. - CREATE FUN PRINTS - Use the block printing starter kit to create your own prints, greeting cards and many other paper crafts. - INCLUDES INSTRUCTIONS - The linoleum block printing set comes with a basic instruction booklet. Reference the step-by-step images on the back of the box for more detailed instructions.